The blogging world just changed again! Now you can put totally free and legal pictures from one of the top stock photography websites in the world into your blog posts! 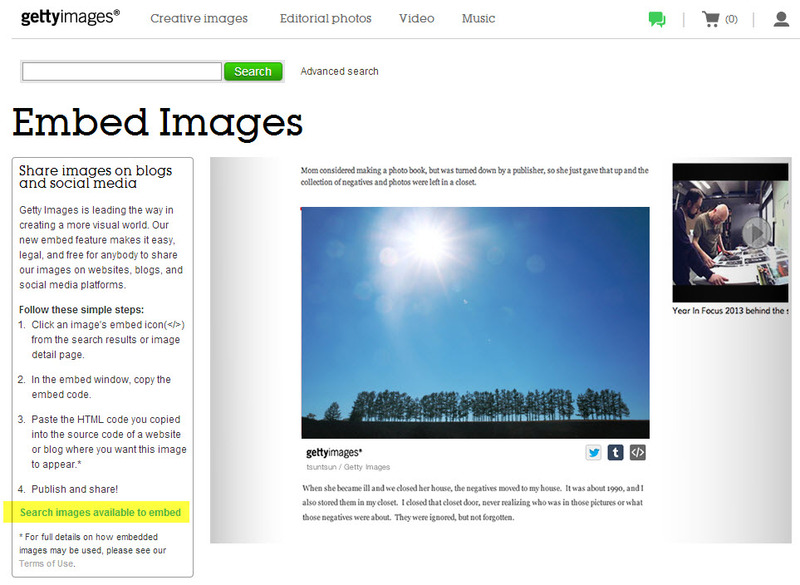 You can now embed over 35 million images, totally free into your blog posts, thanks to a new change at Getty Images. 1. High quality images – unlike using creative commons images, another source of free images, Getty Images has always been known for carefully screening their images for quality so you don’t have to spend tons of time trying to find the perfect image. 2. Access to pictures not normally available without payment – Getty has a huge library of editorial images, basically pictures that have run in the news. Prior to this, it’s been almost impossible to find truly legal images of politicians, movie stars, news events and personalities. So you can now rest assured that you’re not going to get sued for putting a picture of someone famous on your blog. 3. Quick and easy – simply grab the embed code, just like you do on YouTube, paste it in, and you’ve got an image for your blog. 3. When you find an image you like, hover your cursor over that image, which will pop up larger version of the image with an embed button at the bottom. click on that button. 5. In WordPress, put your cursor where you want the picture to appear, click the text button (next to the Visual button in the upper right corner of your post editing box) and paste the code there. 6. Then block the code you just pasted in and click the code button, which will put a code command in front and in back of your code, ensuring that WordPress sees that command as code it’s supposed to execute, not words it should display on the page. Now, there are a few disadvantages to this. 1. 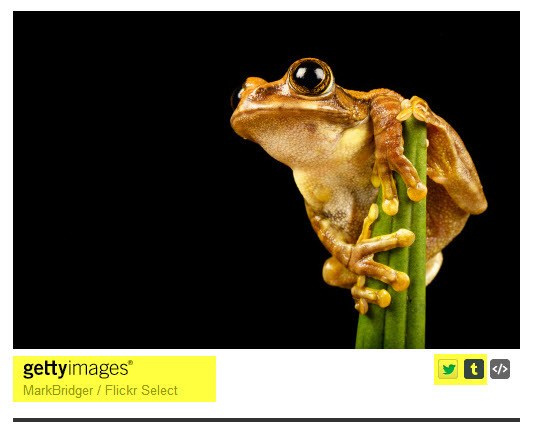 Getty’s going to put way too much copy below your picture, advertising their image. Plus, the Twitter and Tumbler buttons in that point to Getty, not to your page. That’s a price you pay for getting free images. If you can’t live with it, don’t use their pictures. 2. Eventually, Getty’s probably going to start running ads on the pictures, much like YouTube does with embedded videos. We don’t know what those will be, but again, that’s a consequence of making that choice. 3. You can’t use this for getting images on which you can write your own cleaver sayings. 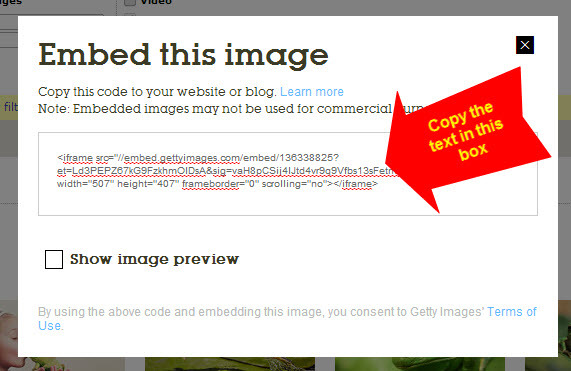 To do that, you’ll need to actually license the image from Getty. 4. These images won’t show up in your list of images to pin, so you you won’t get pins from them. 5. They can’t be used for commercial purposes 6. Because these pictures are embedded, your post will load more slowly than posts that don’t contain embedded pictures. But, if you can live with those conditions, this is a great way to get some quality pictures at a great price! And, I anticipate that other stock photo house will soon follow, making even more pictures available for us to use in the future! 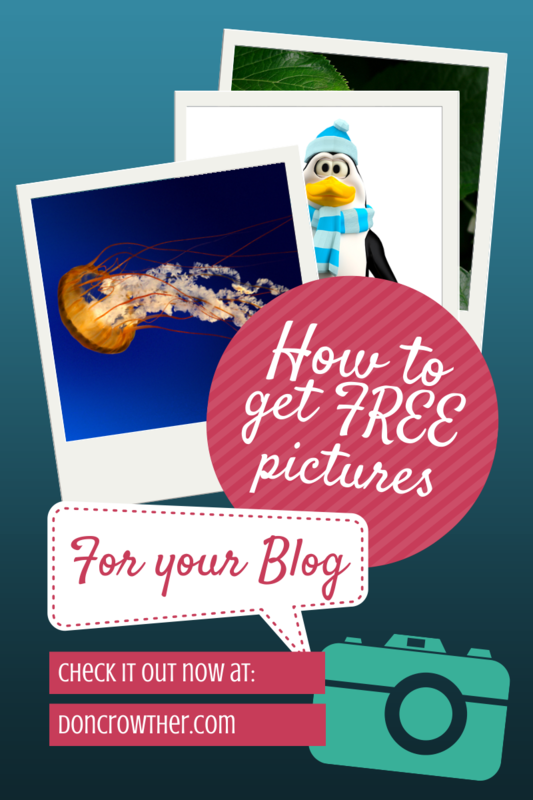 If you can’t live with these conditions, here’s another post on how to add free pictures to your blog. Do you plan to use these images? What do you think of this strategy? Let’s have a discussion in the comments section below. And don’t forget to Like, +1, Tweet, and Pin this post!